Set three years into the Enterprise‘s classic five-year mission of exploration, the movie manages to tell a story that, for lack of another way of putting this, truly feels like a favorite Star Trek tale. Skating around spoilers as much as possible, there’s plenty of action, mystery, wonder, and self-reflection as the heroes work together, using their wits to survive and overcome a brutal struggle against a determined enemy. It’s very personal to the characters without venturing into mopey, brooding territory. Through the crisis that hits them, the characters, two in particular, are able to come to some self-realization and make important decisions about what to do with their lives. Spock’s arc, in particular, was cultivated into what I would call a touching tribute to the late Leonard Nimoy. The enemy is a new one, or at least one I’ve never heard of before, completely original to this movie, rather than something rehashed from the original series. Yet he is a surprisingly intimate foe, not only to the crew of the Enterprise, but to the entire Federation as a whole. I just mentioned the crew survives and wins through use of their wits, right? That was something which was lacking in Into Darkness, where, in the end, defeating Khan was just a matter of making Spock angry. Here, we had some quick analysis and brainstorming under pressure to achieve magnificent results. The alien female who befriends the crew is something more than just “the exotic female.” The trailers left me fearing that she was just Kirk’s latest conquest, but, to my relief, things never even went in that direction! Yay! Instead, she is strong and capable, with a real role to fulfill and her own personal arc. Mind you, the rest of the Enterprise crew were, once again, mostly a plot device. They get abducted or killed, like usual, and the captain has to save as many as possible, and those very few (like, one or two) who we see alongside the main cast are just red shirts, playing a part, then dying or otherwise vanishing from the scene. There aren’t many times when the normal crew are actually very important on their own, are there? That’s always been a little detail about Star Trek that I think could be improved. Of course, there were some other things wrong with this movie. To sum them up all at once: it features a one-shot space vampire attacking a badly-designed space city with an ancient superweapon that is easily foiled. So! 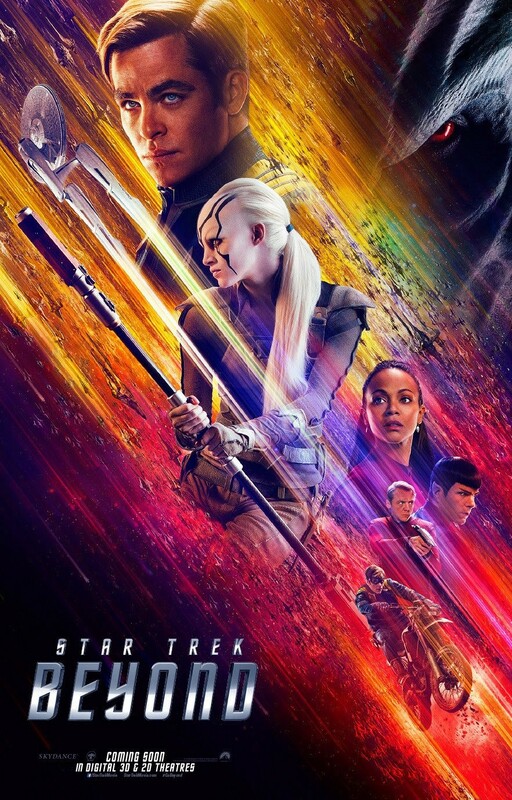 Not a perfect movie, even by Star Trek standards. This entry was posted in Movies, Tuesday Review and tagged Star Trek Beyond. Bookmark the permalink. Had a good time with this. Even if the first two are still great. Nice review.